Now available using the Reina-Valera 1960 translation into the Spanish language, this Bible will open up the doors to in-depth study of the Bible's original languages of Hebrew and Greek. All the features and benefits of using the AMG Hebrew-Greek Key Word Study Bible are available in this edition including Bible book introductions, marking of key words and Strong's numbers, footnotes and center-column references for in-depth study, Old and New Testament grammatical helps section, and Bible and word study dictionaries in the back of this edition. 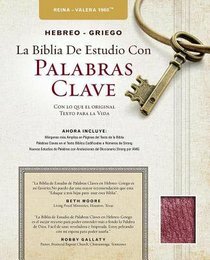 About "Rvr Hebreo-Griego La Biblia De Estudio Con Palabras Clave Burgundy (Hebrew-greek Key Word Study Bible)"